I ordered these in winter white for my family room and living room. They were easy to alter the length to fit perfect, and I sewed 2 pairs together to double the width. The pattern is subtle but stunning. Very happy with this purchase! Shantung Thermal window curtain panels collection are energy efficient, rich in color and texture. These thermal Shantung faux silk panels offer a warm and luxurious feeling to any room in the home. Has the added benefit of blocking light from outdoors and reducing exterior noise. Foam backing insulates room from the heat and cold. Helps protects carpets, furniture and paintings from sun's fading effects. Reduces glare on computer screens and TV's. 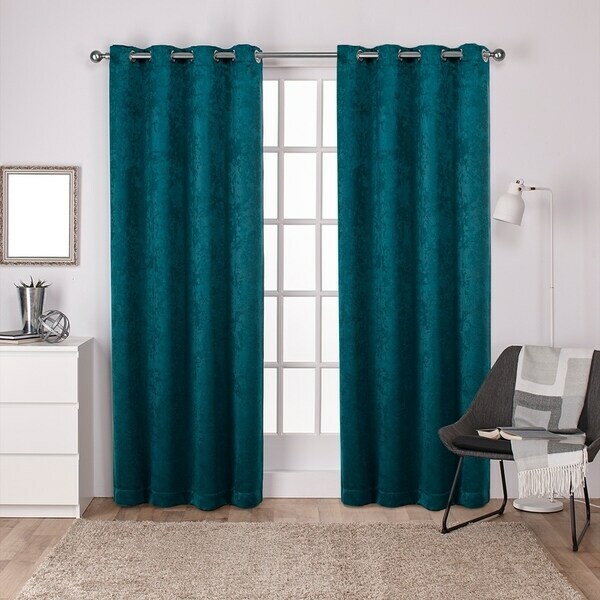 The Shantung drapery is hung on your favorite curtain rod via eight (8) per panel 1 5/8 inch matte silver grommets, yet another touch adding to the richness and luxury to your decor. Perfect for your living room, bedroom, family room, dining room, bathroom, office, or any other window space that could use that perfect finishing touch. Dimensions 96.0 In. X 52.0 In. X 1.0 In. Got these in white and while not as room darkening as I hoped when the sun is coming directly in, the thermal quality makes up for it. They are high quality and beautiful in my family room. Very happy with them. 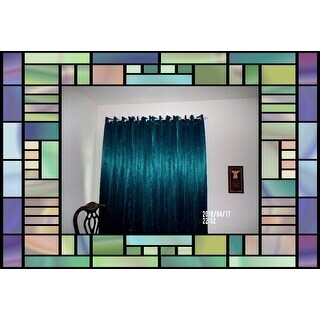 These are gorgeous curtains (I bought peacock for the dark blue/green I wanted), well worth the cost. They are substantial weight wise & hang beautifully. Yes, the curtains are textured, but you have to be very close to see that pattern. They are not blackout curtains, they let in just the right amount of light for my sensitive eyes. The color is the same on the both sides, so what people see looking in are the dark blue/green color. The few wrinkles they had fell out quickly, so I didn't have to iron them. I would buy them again, they are absolutely stunning. Thanks Overstock, VERY pleased. Love these. The color is so pretty and they are definitely black out which is exactly what I wanted since I sleep during the day time. And I liked how it came in a 2 panel set so I didn't have to order 2 of them. Love this set! The color and texture of the fabric is of high quality. They are a bit longer than need but I just hung my curtain rod up a little higher. I would definitely buy them again. These are nice heavy curtains with a very subtle pattern and sheen you can't detect unless you're up close. They are made well, and block some but not all light-enough for our bedroom. They are very soft to the touch. The expected packing wrinkles came out easily with a steamer while hanging. We bought the white curtains and are enjoying them. Would highly recommend the ATI line of curtains. I have purchased 4 sets to date and all are true to color, true to length, and great quality! Very happy with my purchase! Fabric feels great. Beautiful color. Bought these for a client's home. They are absolutely beautiful. Very nice quality and they hang beautifully. Read lots of good reviews. I hope I will be just as thrilled with them. "what color are the grommets on the white curtains?" The grommets are matte silver. "Which green is the teal vs peacock blue. I want to order the darker but I don’t know which option to choose"
Peacock blue is the darker of the two. "When will you get the 84 inch peacock blue size in?" Unfortunately, that size in the peacock color option has been discontinued. "Do you get 2 panels"
Yes, this includes two panels. "Is each curtain 52" or is the total width for the curtain 52"?" Each curtain is 52'' wide.